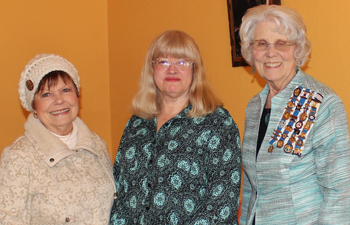 June Yahola and Geneva Bertges were hostesses for the Jan. 15 meeting of the Okemah Chapter of the Daughters of the American Revolution at Pepino’s Restaurant in Okemah. The tables were beautifully decorated with patriotic décor with a floral red white and blue centerpiece. After Regent Rebecca Hold led the opening ritual, flag salute, and the National Anthem, Regent Hold and acting Chaplain Velda Bradley administered the Oath of Membership to new member Patricia Funchess. Patricia was welcomed with a single rose, a yearbook, and a membership tote. Geneva Bertges gave a most interesting program about her Revolutionary patriot, Sergeant Robert Cypert from North Carolina who fought in the Battle of Brandywine. She presented a chart she had made showing pictures of her ancestors. Regent Hold reported that she and member Dorothy Haynes visited veterans at Fountain View and Bono’s Nursing Homes and presented 13 veterans with a miniature Christmas tree for their room, a card thanking them for their service, and a candy snack. The chapter voted to be hostesses for the Naturalization Ceremony March 13 at the Riverfield Country Day School. Four members volunteered to make cookies and the chapter will furnish small flags and bookmarks for the 30 to 40 newly sworn in American citizens. Hostesses Yahola and Bertges conducted the drawing for the door prizes which were won by Mary June Cashman, Velda Bradley, Becky Hold, Sheldon Starr, and Geneva Bertges. The next meeting will be Feb. 19 at Pepino’s Restaurant at 11:30 a.m. Rebecca Hold will present the program ”Trees Have Played Dramatic Roles in American History,” and Mary June Cashman and Velda Bradley will be the hostesses. The meeting was adjourned by Regent Hold, and the following eleven members were in attendance: Ann Jackson, Velda Bradley, Mary June Cashman, Sheldon Starr, Theo Crawley, Rebecca Hold, Patricia Funchess, Judith Drennan, Lucretia Harkey, and the hostesses Geneva Bertges and June Yahola.